Google has just announced a new version of Android dubbed as ‘Android L’, which is available to developers today as a Developer Preview, and features a bold new look and design. More details can be found right here. 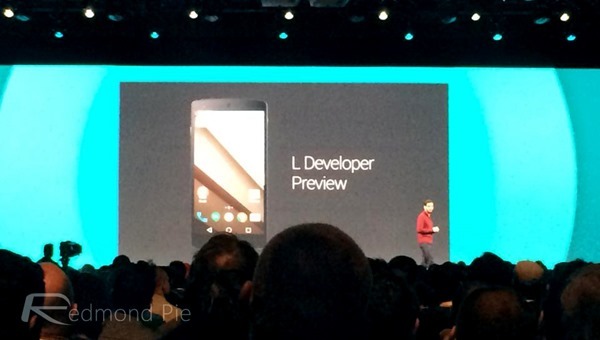 We knew in advance of today’s I/O keynote that Google would showcase Android L, and just a short while ago, Sundar Pichai and Matias Duarte gave us our first glimpse of the Android L Developer Preview. The next version of Android is being designed, as Pichai suggests, ”not just for mobile, but for form factors beyond mobile,” and will be integral to Google’s new “Material Design” initiative. Android L will perhaps serve as the most significant change to Google’s mobile OS since its inception, and while the last few revisions through KitKat have offered mainly superficial improvements, the Material Design factor is set to offer a more animated, bolder, and better-functioning Android experience. 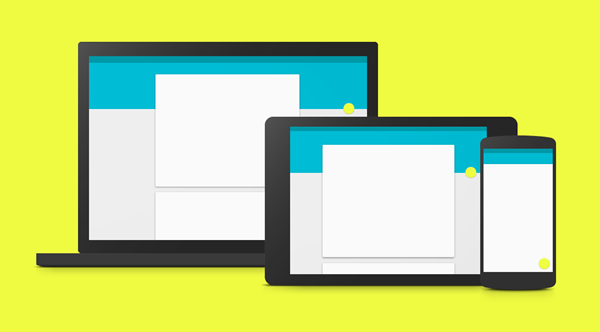 Android L features a brand new design ethos which Google is dubbing as ‘Material Design’. But the design language is not limited to just smartphones, but it goes beyond tablets and into devices with different form factors. 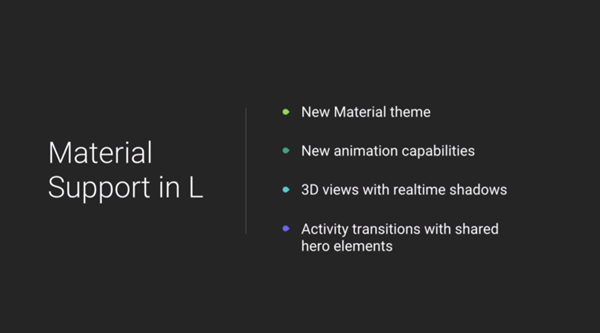 In short, the new design language makes the overall UI of Android L flat, and features bold colors, improved grid lines, typography, animations and more. And like we mentioned before, Material Design goes beyond pocketable devices, which means developers can take advantage to the new design language on Chrome and the Web. 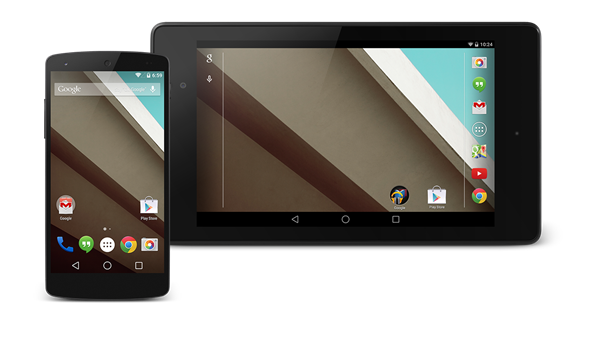 On the developer end, Android L is a haven for those creating apps and services. With over 5,000 APIs added, it’s safe to say that Android L opens up a lot of key possibilities for developers. It’s no secret that Google is looking to promote uniformity, bucking that common trend of varying user experiences depending on platform, and the Android L open Developer Preview allows developers and general Android enthusiasts to get a taste of things to come. We’re only a short way into the conference at this point in time, but Google has already presented a number of demonstration videos showcasing a more functional and layered future for its mobile OS. Transitions seem to flow with more finesse, while animations, which Google sees as a necessary part of the mobile experience, are also prevalent. Notifications will also be getting an overhaul, with a whole new system in place that will also keep you in the loop from the lock screen. There are also some neat new shadow, ripple and 3D effects thrown in, allowing devs to create elements that can overlap and bringing a sense of immersion and movement. Rather than trying to make the already-simple OS more fanciful, Google believes these effects will greatly enhance the user experience, and on first glance, we’d have to agree. Android L is not a compromise over previous releases and things are starting to shape up rather nicely this time around. Google has switched the runtime environment to ART from Dalvik, so that apps launch faster, graphics have been given a boost, and battery life has been improved significantly over previous releases. But there’s more, Android is now 64-bit capable! Google has even gone as far as saying that we’ll see high-end tablets and phones with “PC Gaming” capabilities. That’s a bold statement, and if true, it’s a giant leap in mobile for Android. From a security point of view, Android L is once again looking to tighten things up, with a myriad of new features being added. For example, there’s a new “Universal Data Controls” hub, allowing a user to find all relevant security-related features under one roof, with “factory reset protection” also thrown in allowing users to remotely wipe data at stock level. Android L now features built-in malware protection, and security patches for the operating system will be delivered to the user using Play Services, which means the user wouldn’t even know that they are being protected, making the whole process seamless as possible.